New York, December 10, 2014 – The International Center for Transitional Justice (ICTJ) welcomes the release of the final report of Brazil’s National Truth Commission after two and a half years of work to unveil the truth about serious human rights violations that took place in the country between 1946 and 1988, especially during the military dictatorship of 1964 to 1985. 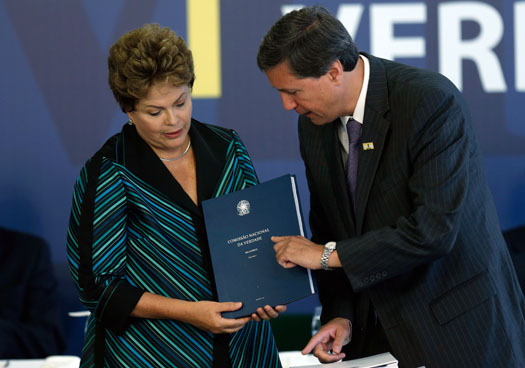 The final report is a historic contribution to truth and justice in a country where serious crimes have remained unaddressed for decades and calls on the Brazilian judiciary to disregard the Amnesty Law and act in cases of crimes against humanity. The truth commission was able to confirm 434 deaths and enforced disappearances committed under the military regime: 191 people were killed, 210 were disappeared, and another 33 were identified as disappeared whose bodies were later found. However, the commission states that these figures do not reflect the total number of victims and calls for further efforts to collect data, establish the facts, and identify victims. Among its efforts, the commission documented the systematic use of torture against political prisoners and the brutal repression of social groups considered to be a “threat” to the military regime and its ideology, such as labor unions, university students, peasant movements, indigenous peoples, and lesbian gay bisexual and transgender communities. "The commission served the rights of victims and Brazilian values by clearly stating that perpetrators of crimes against humanity cannot be granted impunity,” said David Tolbert, President of the International Center for Transitional Justice. “As the commission makes evident, the 1979 amnesty law, which was originally intended to allow for the release of political prisoners and dissidents, cannot be used to cover up serious crimes. We are confident that the Brazilian authorities will act on the recommendations of the commission to end the current situation of impunity in the country." In its recommendations, the commission asks the Brazilian judiciary to establish the legal responsibility — criminal, civil and administrative — of those involved in serious, systematic human rights abuses and not apply the 1979 Amnesty Law in relation to those cases. The Commission states that an amnesty for state agents who committed illegal and arbitrary detentions, torture, executions, enforced disappearances and hiding of corpses is incompatible with both Brazilian and international law. Other recommendations from the commission include institutional and legal reform, especially of the Armed Forces, as well as reparations measures. The report specifically asks for the Armed Forces to recognize their institutional responsibility for human rights violations committed during the dictatorship and stresses that the institutional attitude of “not denying” the facts is insufficient. "Brazil demonstrates with this report its willingness to uphold victims' right to know the truth and its respect for the nation's demand for genuine historical memory, even decades after the dictatorship,” said Eduardo González, Director of ICTJ’s Truth and Memory Program. González provided technical assistance and advice to the commission since its inception. It is worth highlighting that, according to the commission, it was able to establish the truth about systemic crimes despite the lack of collaboration, or even the obstruction, of the Brazilian Armed Forces. "The passage of time, and the persistence of silence and impunity did not intimidate the survivors. This report is an homage to their persistence and their loyalty to the memory of their loved ones," added González. The commission does not consider the release of its final report as a final chapter, but a first step in the country’s journey towards learning more about its past and preventing the recurrence of crimes. It recommends the creation of an administrative body to work in coordination with existing institutions to continue gathering information and investigating cases, such as massacres against workers and the support of businesses. This administrative body would also monitor the implementation of the commission’s recommendations and collective reparations, such as the identification and return of victims’ remains to their relatives and the enforcement of policies aimed at disclosing military archives.